Projex Group announces that their Damtec sub ballast mat conforms to the ASA and TfNSW Standard for Ballast (T HR TR 00192 ST 2016), Section 11.6, Track stiffness and ballast mat. 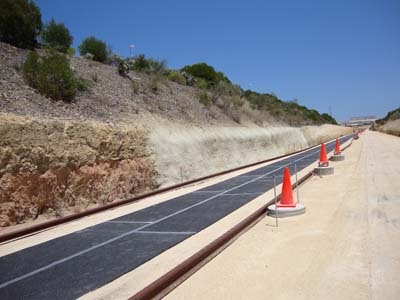 The Projex Damtec sub ballast matting (SBM) is an isolation and protection mat suitable for all types of railway construction and infrastructure maintenance in heavy rail, heavy haul rail, high speed, rapid transit and light rail networks. Thanks to its ability to absorb vibrations and considerably reduce acoustic emissions as well as structure-borne sound transmissions, the SBM protects sub-grade formations and lowers frequency of ballast maintenance requirement through reduced vibration and better-balanced loading. The railway system is a crucial component of the Australian transport network. Wear and tear of the rail infrastructure happens over time, exacerbated by harsh terrains, axle loads, and operational and urbanisation requirements. By installing Projex Damtec sub-ballast matting, the rail network can improve operational performance and reduce peak pressure in the ballast, thereby increasing the stability of the track geometry, and effectively reducing structure-borne sound and static vibrations. Made from a special mixture of PU foam and high-quality virgin rubber granules with a PU elastomer bonding agent, Projex Damtec sub ballast mat is extremely tough and durable, and available in two thicknesses - 10mm and 20mm. Key benefits of Projex Damtec sub-ballast matting include German manufactured product with superior performance; proven and tested technology; extremely cost-effective and easy to install; range of dynamic static stiffness to suit different track requirements and applications; compliant with quality, regulatory and engineering standards; recyclable product; high kinetic energy absorption; insulation of acoustic and vibration emissions; and stock availability in Australia. SBM has been used in several rail projects across Australia such as the Butler Extension in Perth, the Roy Hill - Heavy Haul Rail Project in northern Western Australia, the Regional Rail Link, the Maribyrnong River project in Melbourne and numerous projects throughout Queensland. All Projex Group railway products have been tested and certified to industry standards, and are designed to offer optimum solutions to meet individual application requirements. They are durable, high performing, cost-effective, environmentally compliant and easy to install.